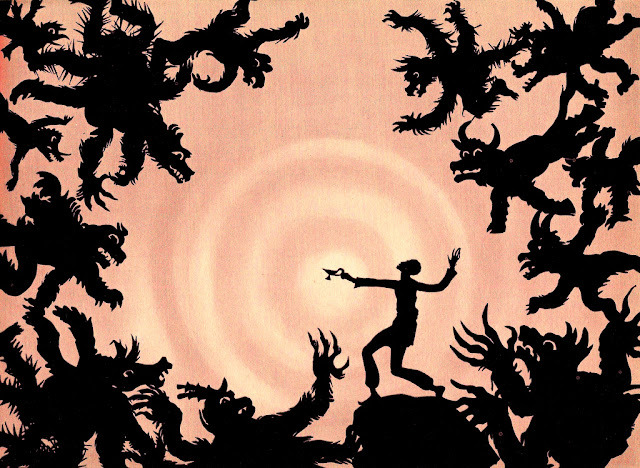 The Adventures of Prince Achmed is the oldest surviving animated feature film. But to modern eyes it looks stylishly avant-garde, an piece of animation that by its very nature was experimental, yet one that's aged fantastically. The director, Lotte Reiniger, became fascinated with the art of silhouette animation as a child, building puppet theatres to entertain her family and friends. Her childhood passion developed as she grew up, becoming enchanted with the work of Georges Méliès, leading to her attending lectures by early film-makers who rhapsodised of the infinite possibilities of film and animation. Her passion stoked, she ran off to join the Theatre of Max Reinhardt, and began creating elaborate title cards for film production companies throughout Germany. She used this as a springboard into the early German film industry, creating a series of animated intertitles for a live action version of the Pied Piper of Hamelin, and soon becoming involved with a heady group of artists including Bertolt Brecht, Hans Cürlis and Kurt Weill. She went on to form the nucleus of a group of ambitious German animators, who sensed that should the right opportunity come along they could make something fantastic. Damn this film looks great. That opportunity was soon to fall into her lap. With the German economy in the 1920s undergoing hyperinflation, many businessmen were investing their money in raw materials that they hoped would keep their value. One of these businessmen was Louis Hagen, who decided to invest his money by buying a huge amount of film stock. With all this on his hands, he wanted to make a film, and contacted Weiniger. She jumped at the chance, quickly deciding to make a piece of animation more ambitious than anything before it, necessitating the painstaking creation of 250,000 frame by frame stills, the surviving product of this labour being the film I saw at the Barbican on Friday. 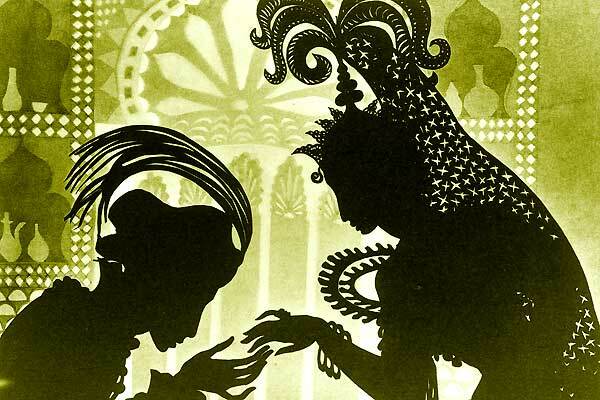 Prince Achmed is a loose adaptation of 1001 Arabian Nights, mixing up a plot from elements of The Story of Prince Achmed and the Fairy Paribanou and the more familiar tale of Aladdin and his Magical Lamp. I was fully prepared to cut this film a lot of slack, I mean, the oldest surviving animated film is going to be a bit crude, right? But, from the off I was impressed by both the scale and, even more surprisingly, the humour of the film. The stunning colour is a duplication of it was originally tinted, this restoration being from the late 1990s. Humour tends not to age well. With the obvious exception of slapstick (let's face it, a guy slipping on a banana peel is never going to get old), films that try for something more sophisticated became dated very quickly. 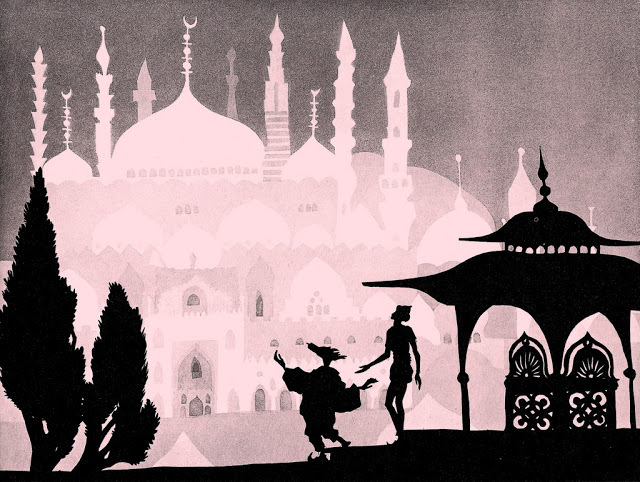 But, Prince Achmed frequently and seamlessly dips from fantasy action into some neatly deadpan moments that got the entire audience giggling. My favourite was a moment involving the evil Sorcerer, he's placed Prince Achmed on a magical horse which has rocketed into the clouds. 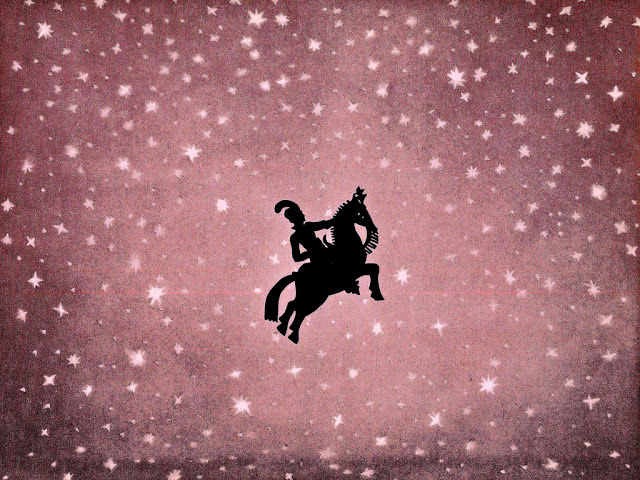 The Sorcerer assures the Sultan that Prince Achmed will be fine, the horse has controls to raise and lower its altitude. The Sultan angrily asks whether Prince Achmed knows that. Cut to a reaction shot of the Sorcerer's face, and then soon after, cuts to him in manacled in a dungeon - all with perfect comic timing that works 87 years after release. Also great fun are Prince Achmed's farcical antics in trying to fend off the over-amorous advances of some horny concubines in the magical cloud Kingdom of Wak-Wak. A large part of what makes this humour work so well is precise timing, but the excellent animation goes a long way in creating a characters that are both archetypes and individuals. The silhouette-based animation leaves little room for subtlety, and, obviously this is a 1926 film, so there's no voices. What this us with is essentially animated mime, and it's incredibly effective. Things like the bony, probing fingers of the evil Sorcerer, the superheroic, upright, chest out, chin out, posture of Prince Ahmed and the gracefulness of the mysterious Princess Pari Banu tell you all you need to know about the characters. When the action moves up a gear, Reiniger's animation techniques effortlessly capture the excitement of fending off packs of flying demons, battling a giant snake and even an apocalyptic battle between the supernatural armies of good and evil. You'd imagine the relatively abstract animation style to require the audience to do some mental heavy lifting, to imagine the action they're trying to convey. Surprisingly, you don't need to do this at all, everything you need to see is right there on screen, a testament to the clarity, scope and expertise of Reiniger's technique. The screening I saw was accompanied by a live score by composer Bushra El-Turk, a Lebanese-born British musician. Her ensemble is a composed of players of both classical and Middle Eastern instruments, creating a slightly hypnotic wall of sound to accompany the picture. Right from the off, the images and sound melded together and I intently focussed on the screen rather than the musicians playing just below it. At screenings with a live score I'm always tend to lose myself in what's shown on screen appreciate the accompaniment more on a subliminal level. But I tried my best here, I appreciated the way El-Turk avoided the cliched, "snake charmer" Arabian motifs that remind me more of a Victorian,imperialist approach to Eastern exoticism than anything genuinely mysterious. El-Turk's score let me drift off into the realm of the film, adding texture rather than overpowering what was on screen. I can start to see where Genndy Tartakovsky got some inspiration from. 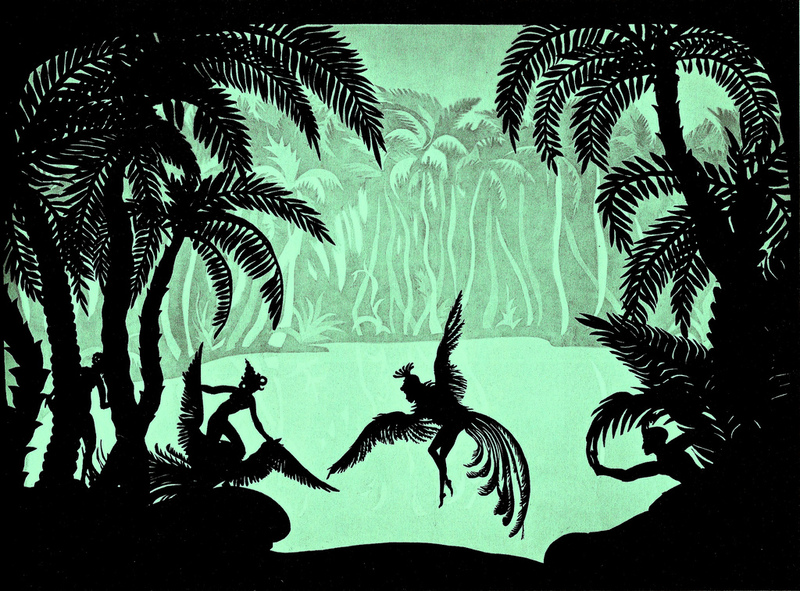 Prince Achmed isn't without its faults though, but they are at least understandable ones. The characters of the Chinese Emperor, the African Sorcerer and Witch are straightforward racial stereotypes - but I'll cut Reiniger some slack on this considering that Weimar Germany, while relatively progressive by the standards of the day, was still light years behind what we'd consider appropriate, and secondly because when the Nazis came to power, Reiniger and her husband left the country, going into self-imposed exile because:"I didn't like this whole Hitler thing and because I had many Jewish friends whom I was no longer allowed to call friends." Good for her. While waiting for the film to start I saw a few families coming in. I felt a little sorry for these young children; I doubt the kids are clamouring to see a 1926 animated film with a live soundtrack, and I'm sure given the chance they'd rather be watching The Croods or something. But, within a few minutes, I looked over and they seemed enraptured, laughing at the right times, and gazing at the screen in wonder during the fantastical and scary bits. That a film can still work so well after 87 years, remaining compelling, beautiful, funny and exciting is nothing short of miraculous. Thanks to Birds Eye View and Jacob Brookman for the tickets.